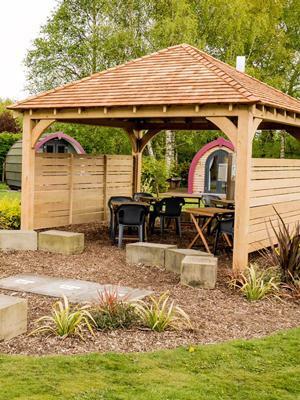 We were contacted by York Holiday and Cycle Stop to design and build a bespoke, traditionally built Oak Frame Gazebo in York to provide a focal point and shelter for there Glamping clients. We specified Western Red Cedar shingles for the roof finish and constructed the Oak frame to our usual high standards, paying very careful attention to detail. The photographs speak for themselves and everyone is delighted with the results.